The trial's second phase started on Wednesday. A federal jury in California found that a Monsanto's Roundup weed killer caused a 70-year old man's cancer, the second major blow for the company in a year. The six-member jury in San Francisco federal civil court unanimously concluded on Tuesday that glyphosate — Roundup's key ingredient — was a "substantial factor" in Sonoma resident Edwin Hardeman’s non-Hodgkin’s lymphoma. The jury's verdict is the second out of a long list of future lawsuits. Approximately 11,200 plaintiffs, who claim they were exposed to glyphosate, are suing the company as of Jan. 28, according to the company's annual report filed with the Securities and Exchange Commission (SEC). Hardeman's lawyers said the elderly man developed non-Hodgkins lymphoma after using Roundup to spray his properties for almost three decades. On Wednesday, Hardeman's trial started its second phase, in which the jury will decide if the company is liable and possibly award damages to Hardeman. The next phase will focus on how Groundup was marketed and if the company hid the product's alleged risks. (Haven Daley/AP, FILE) Containers of Roundup are displayed on a store shelf in San Francisco, Feb. 24, 2019. 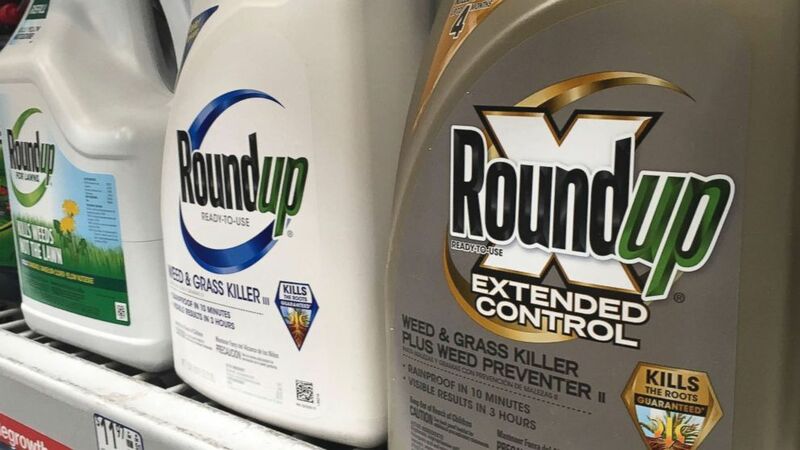 A jury in federal court in San Francisco has concluded that Roundup weed killer was a substantial factor in a California man's cancer. "We are disappointed with the jury’s initial decision, but we continue to believe firmly that the science confirms that glyphosate-based herbicides do not cause cancer. We are confident the evidence in phase two will show that Monsanto’s conduct has been appropriate and that the company should not be liable for Mr. Hardeman’s cancer," the company statement said. "As early as the 1980’s Monsanto was aware of glyphosate’s carcinogenic properties.” Hardeman’s suit claims. In 1985, the Environmental Protection Agency’s ("EPA") Toxicology Branch published a a memo glyphosate as a "possible human carcinogens with limited evidence of carcinogenicity." The lawsuit lists several studies linking glyphosate to cancerous behavior. The American Cancer Society lists the substance as a "probable carcinogen," determining it is "probably carcinogenic to humans" by the International Agency for Research on Cancer, a part of the World Health Organization. Bayer says more than 800 studies submitted to EPA, European and other regulators "confirms that these products are safe when used as directed," including a 2018 independent National Cancer Institute-supported long-term study that "found no association between glyphosate-based herbicides and cancer," the company statement said.